The exact date that the frontispiece became a convention in printing and publishing is hard to pin down. Engraved title pages predate frontispieces, but confusingly some scholars use the terms ‘engraved title page’ and ‘frontispiece’ interchangeably. The Lutherans first used engraved title pages ‘as a means of pictorial propaganda’ in the early 16th century. They became a means to convey, in an aesthetically pleasing and usually symbolic way, the subject, title, and publication details of the book. This geometrically compartmentalised title page is from a Breeches or Geneva Bible. The tents of the twelve tribes are to the left; the twelve apostles are on the right; and the four evangelists, Matthew, Mark, Luke, and John, surround the heart enclosing the title. 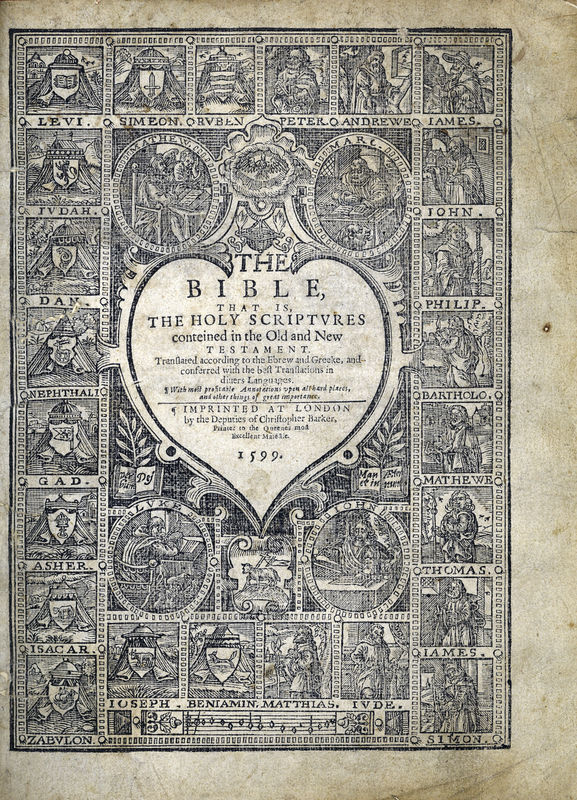 ___, “The Bible, that is, the Holy Scriptures conteined in the Old and New Testament,” ourheritage.ac.nz | OUR Heritage, accessed April 20, 2019, http://ourheritage.ac.nz/items/show/10664.